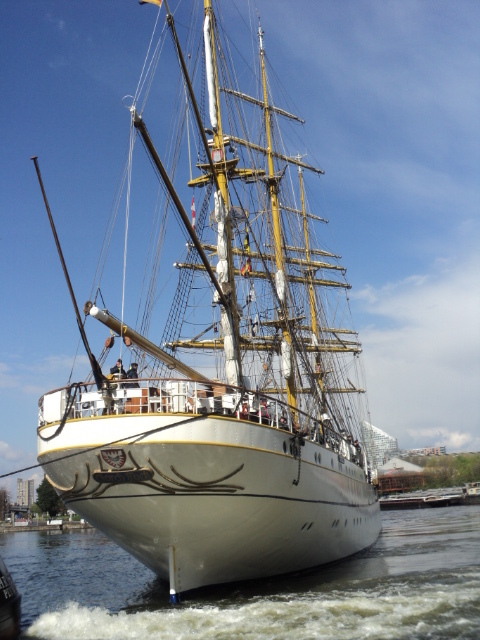 A little bit like steam trains, a tall ship with sails and a network of rigging conjures up images of nostagia. 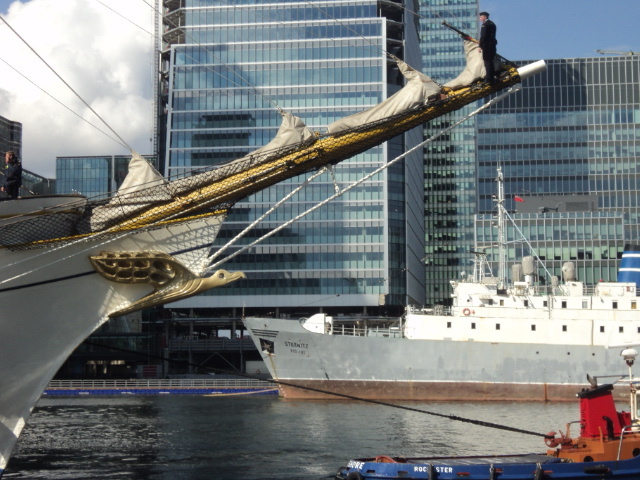 If you are British and of a certain age it is very difficult to see a sailing ship without the soundtrack of the Onedin Line playing around somewhere in your mind. 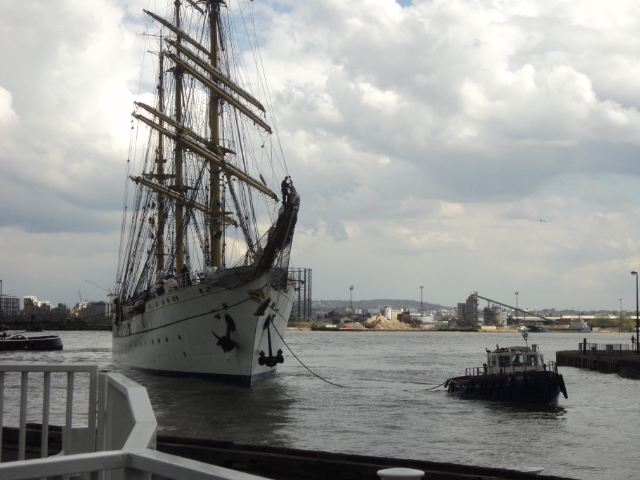 The Gorch Fock next to the old dock cranes with the O2 in the background. 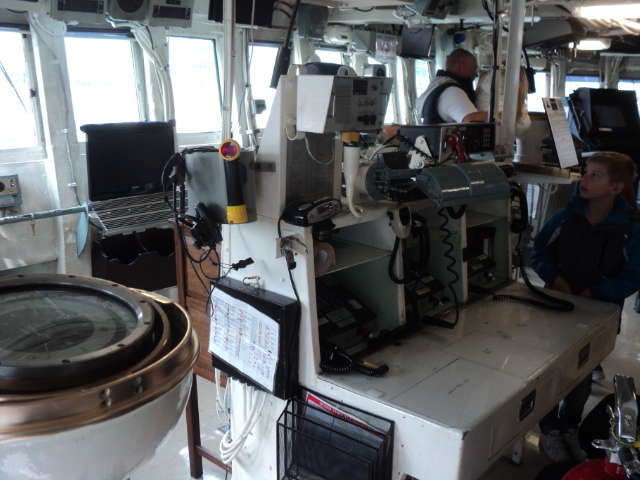 HMCS Iroquois is fitted with state of the art command and controls systems. One of the crew ? Among the Canary Wharf skyscrapers. 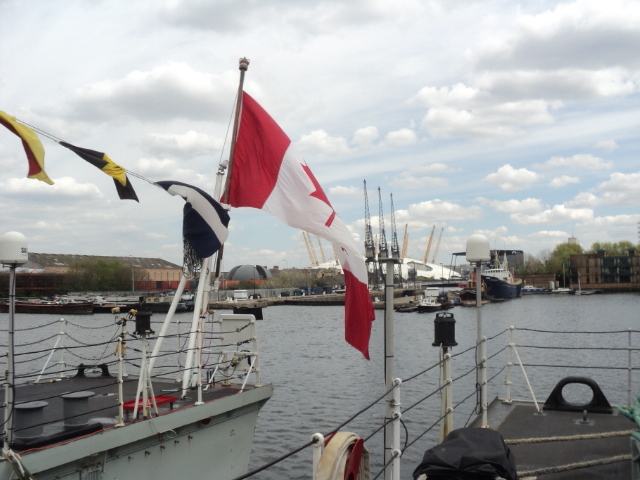 The Maple Leaf and the O2. 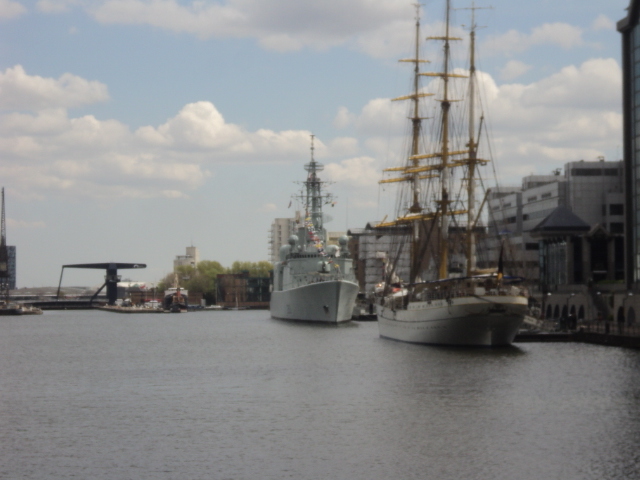 Old and New, the HMCS Iroquois and Groch Fock in West India Dock. 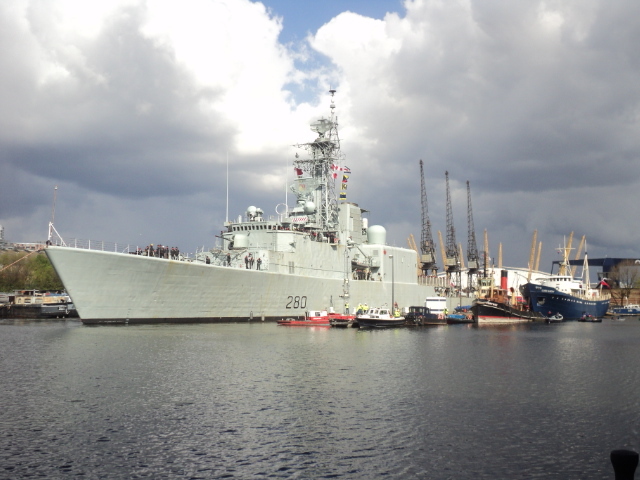 After welcoming the Gorch Fock to the West India Dock yesterday, today we welcome a Canadian Warship the HMCS Iroquois. 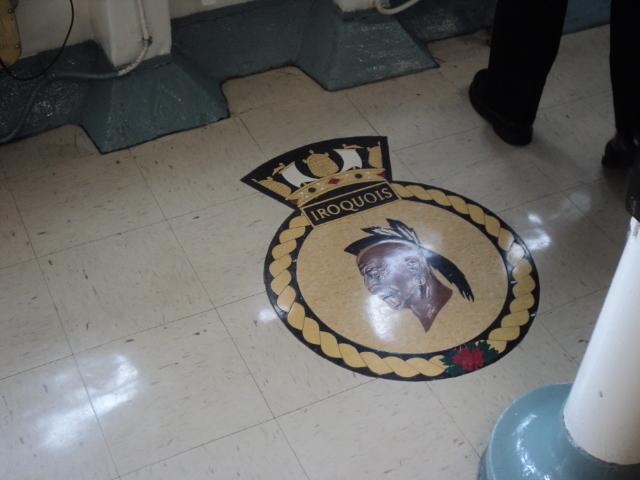 There is around 282 men and women in the Iroquois crew. 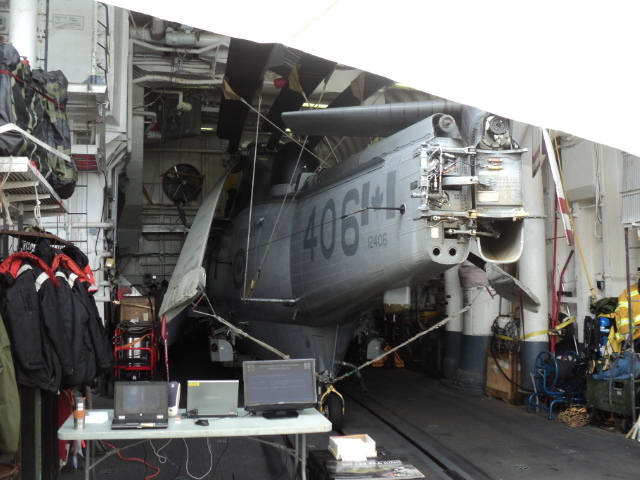 Her primary weapons were anti-submarine which included mortars, homing Torpedoes and two CH-124 Sea King helicopters, also armed with torpedoes. 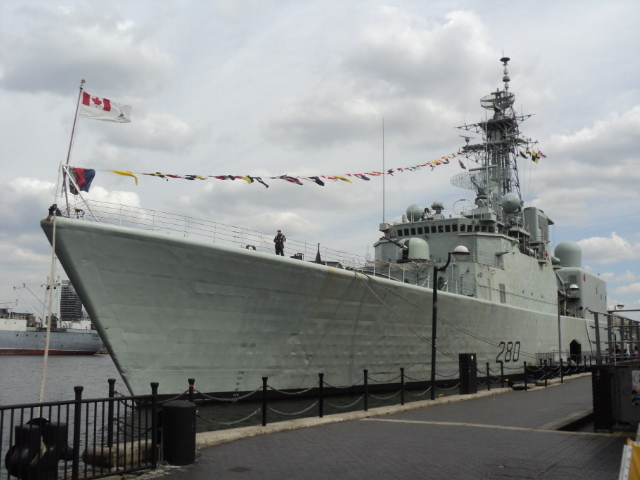 The Iroquois will be moored at London’s West India dock from Saturday, April 27 until April 30 to help celebrate the 70th anniversary of the turning point in the Battle of the Atlantic. The Battle of the Atlantic was the longest campaign of World War II and keeping the supply lines open were crucial to Allied victory. 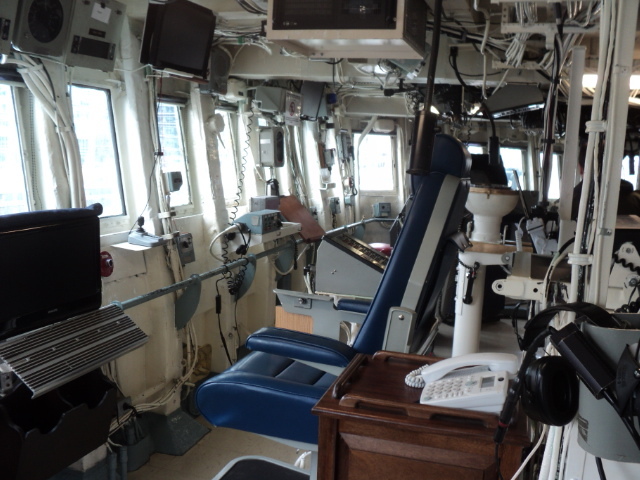 However the cost was very high amongst the Allies shipping with thousands losing their lives. 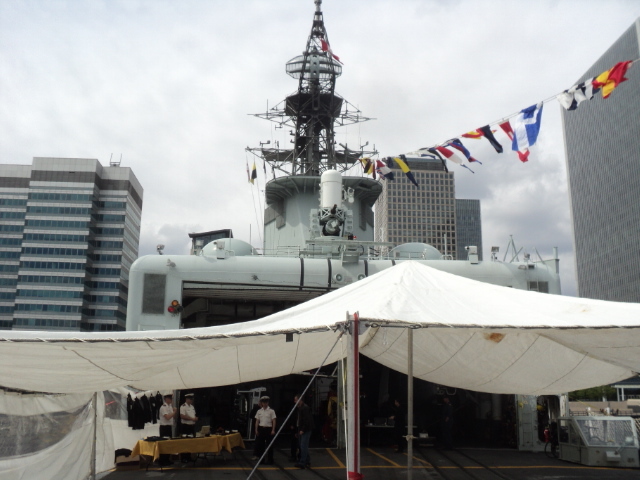 In May 2013 the 70th Anniversary of the Battle of the Atlantic (BOA) will be commemorated with a series of events throughout the United Kingdom. The commemorations will be centred on three cities, London during 8-13 May, Londonderry between 10-12 May, and the culminating event in Liverpool from 24-27 May. 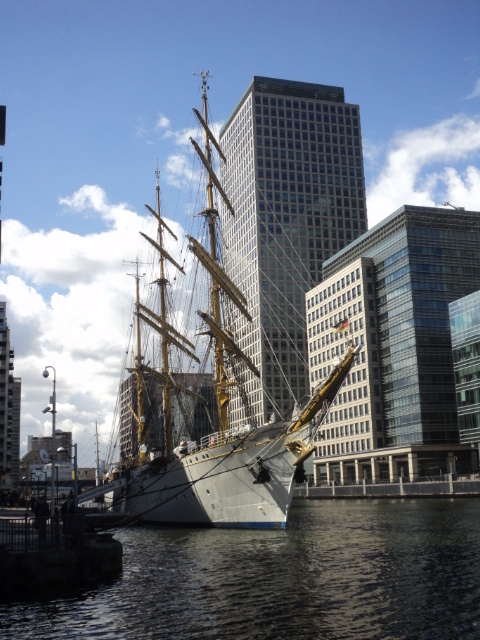 Today we have an impressive visitor in West India Dock in the shape of The Gorch Fock which is a tall ship belonging to the German Navy . 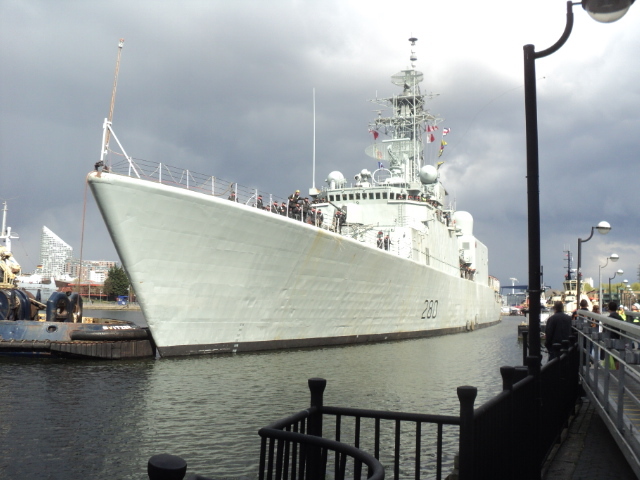 She is the second ship of that title named after a German writer who died at the battle of Jutland. 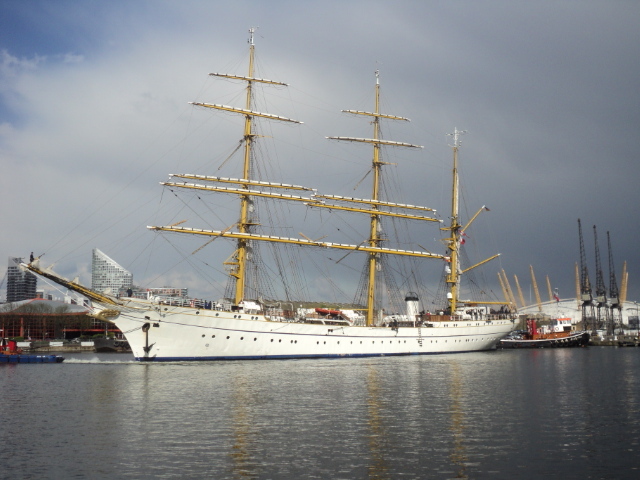 She was built as a training ship in 1958 after the original was taken by the Russians after the Second World War. 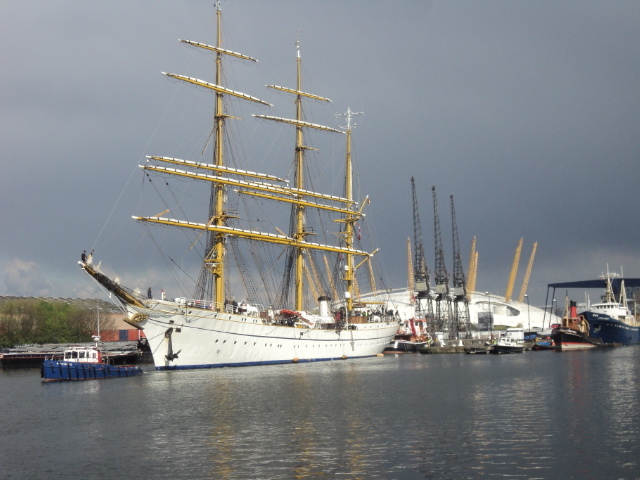 The Gorch Fock is known as a three-masted barque which measures 266 ft long and 40ft wide. 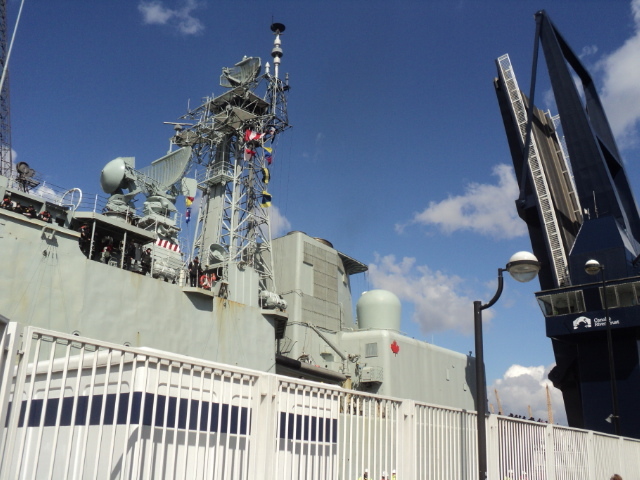 For the technical minded she is a Type 441 class with a number A60. 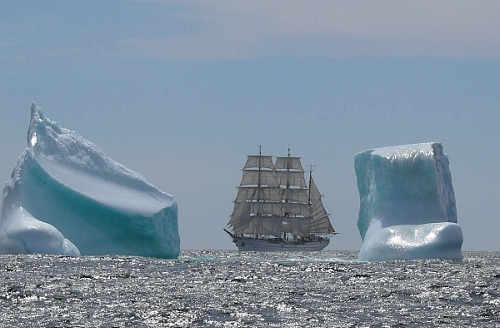 To see what she looks like with sails unfurled, here is an amazing picture from one of her voyages. 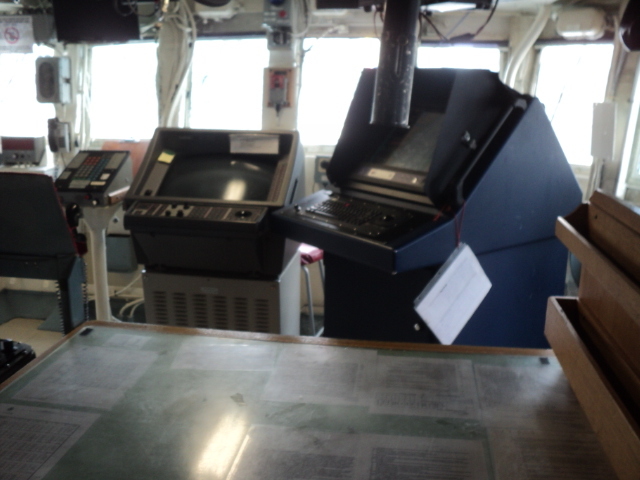 Her other claim to fame was that the ship appeared on a 10 Deutsche Mark banknote from 1960 to 1990. 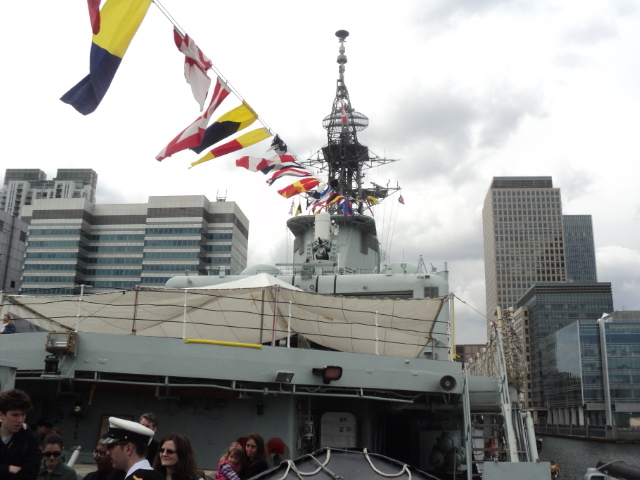 Up to 14,000 cadets have been trained on the ship over the 50 years since her launch, however in recent years the ship has been at the centre of a scandal regarding the treatment of the cadets after an alleged mutiny when one of the cadets died after falling from the rigging in 2010. 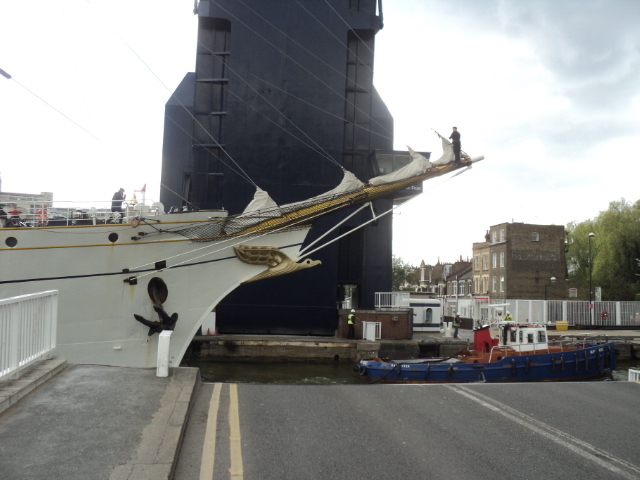 The ship will be open for the public for a visit on Saturday, 27 April 2013 from 2pm to 5pm at her berthing place at South Quay in the West India Docks. 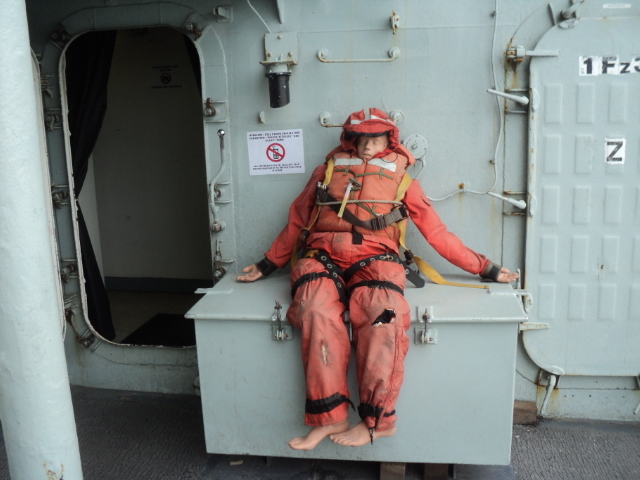 Due to Health and Safety regulations visitors should be at least 12 years old and wear proper footwear. It also may be open Monday 2pm – 5pm. 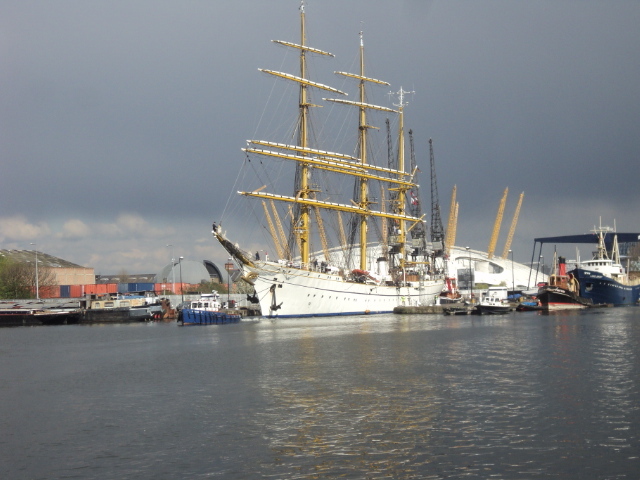 One of the pleasures of living on the Isle of Dogs is the “hidden treasures” that are waiting to be discovered. 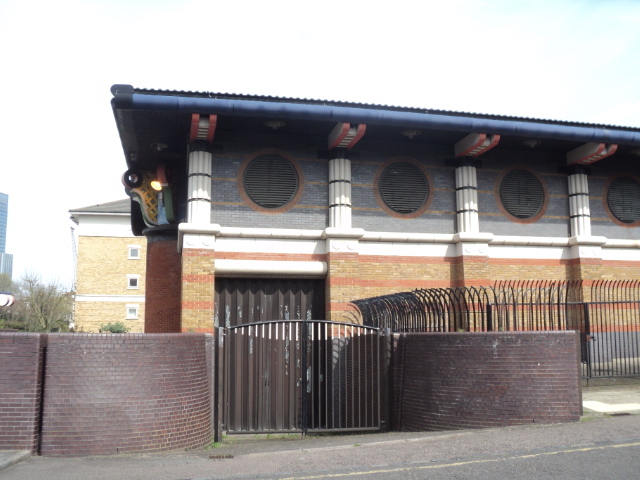 The Storm Water Pumping Station is one of those treasures, When people first come across the Pumping station there is the belief that it is an Eastern Temple, however under closer inspection there are high walls which has slits which gives only glimpses of the “Temple” and locked gates. It is only then you realise it has in fact a rather mundane function, however this did not stop the designer from giving it a mythical design. 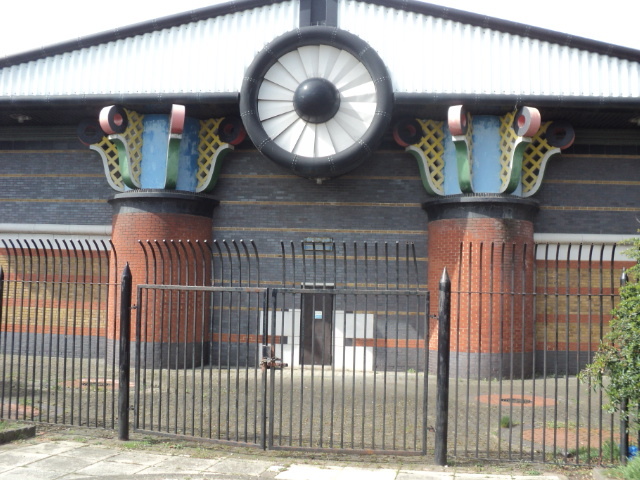 The Pumping station was built in 1987-88 designed by John Outram, inside is a quite plain brick pumping chamber with a tank and a control room. 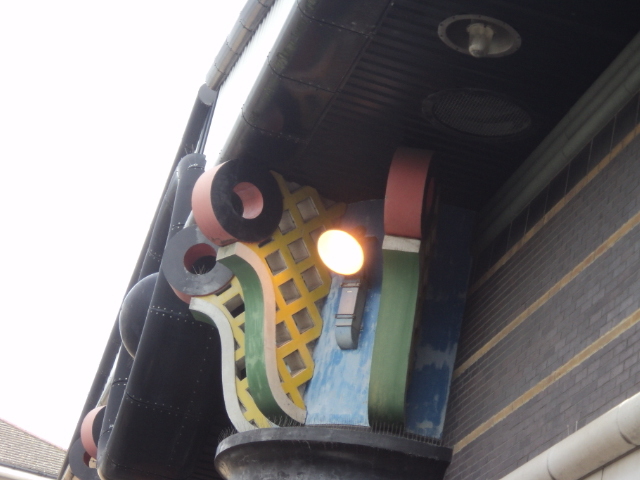 The outside however is full of symbolism which is described by the architect. 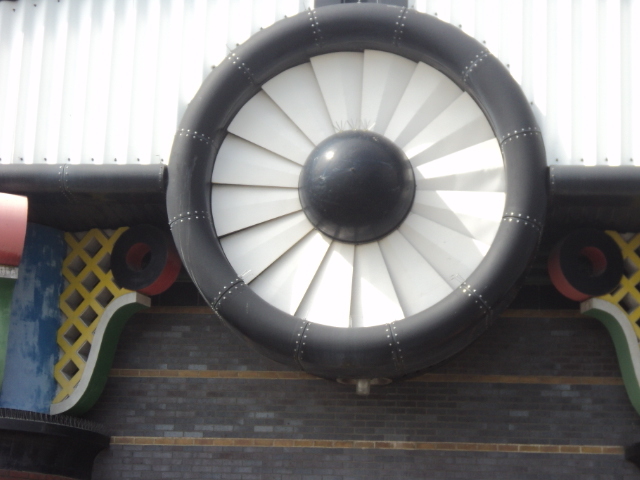 The steel-tube gate into the fortified compound of the Station is given a form of a giant eye, whose vacant ball can be got to line-up with the ‘solar cave’-between-two-mountains. The two wings of the gate-eye then lie over the two (aetos) ‘eagles-wings’ of the split pediment…. identity as the ‘death of the valley of community’ by dispersion into the Ocean. 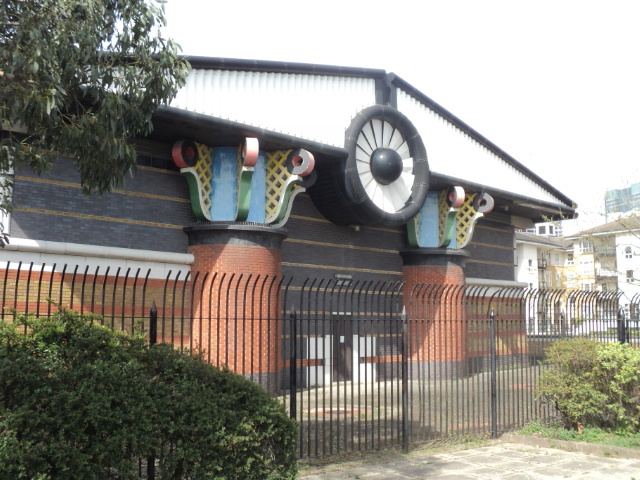 Although considered “Postmodern” in many ways it is also looks back to the Victorian age when seemly unimportant buildings were given ornate and decorative finishes. 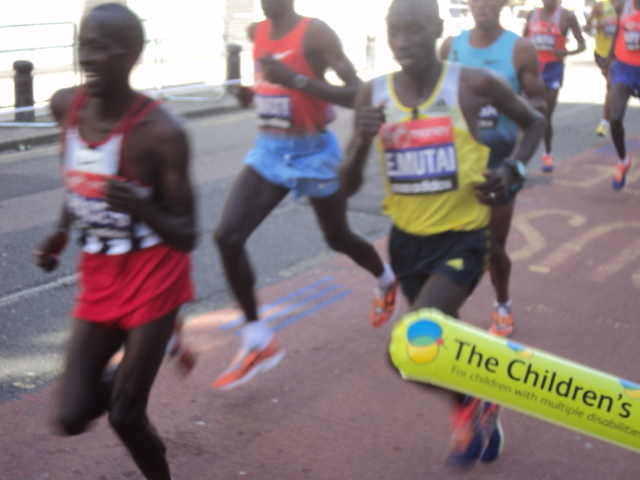 After days of preparation, the day has finally arrived for the 2013 London Marathon. 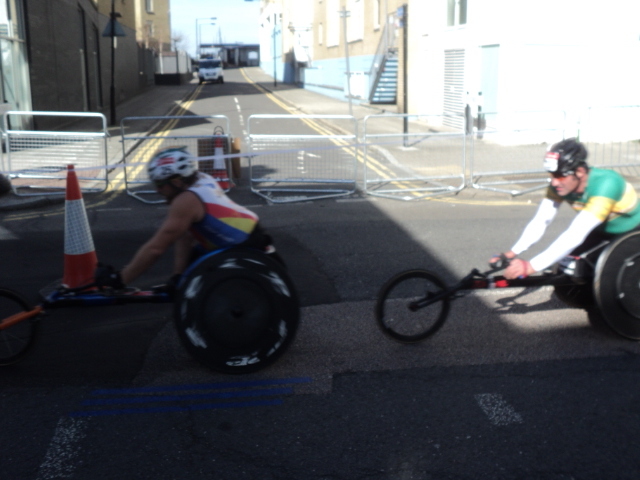 The first arrivals on the Island were the Elite wheelchair athletes, amongst these were David Weir Paralympic hero from last year. Next were the elite women which included Ethiopia’s Tiki Gelana who will be the one to watch after her win at the London 2012 Olympic Marathon.World champion Edna Kiplagat, Priscah Jeptoo will be hoping to go one better than her silver medal at the London 2012 Olympic Marathon. Florence Kiplagat latest win was at the 2011 BMW Berlin Marathon. These were followed by the Elite men which was considered one of the strongest field in recent years. Runners included Uganda’s Stephen Kiprotich, the surprise winner of the London 2012 Olympic Marathon, Olympic silver medalist and world champion Abel Kirui (Kenya) and Olympic bronze medalist Wilson Kipsang. After the club runners was the large mass of the field which included a wide range of abilities, many have their own personal reason for competing often raising a large amount of money for charity. The crowds grow year on year and many consider this year the largest yet, with many people coming onto the Island to support their family members. The mens race was won by Tsegeye Kebede, second was Emmanuel Mutai and Ayele Abshero third. 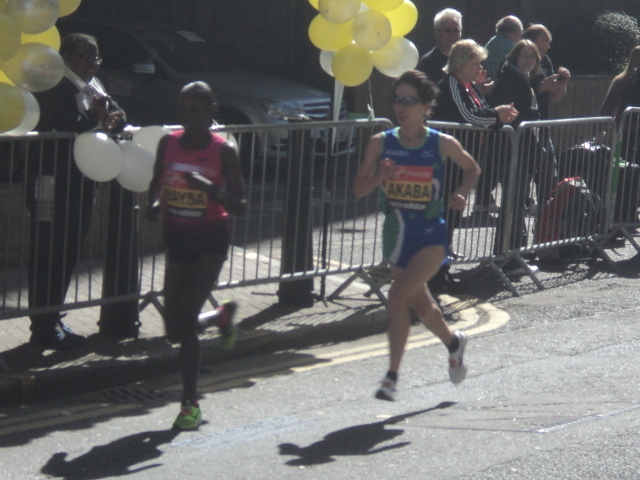 The womens race was won by Priscah Jeptoo, second was Edna Kiplagat and Yukiko Akaba third. However everyone who completes the race and the various charities are the real winners . 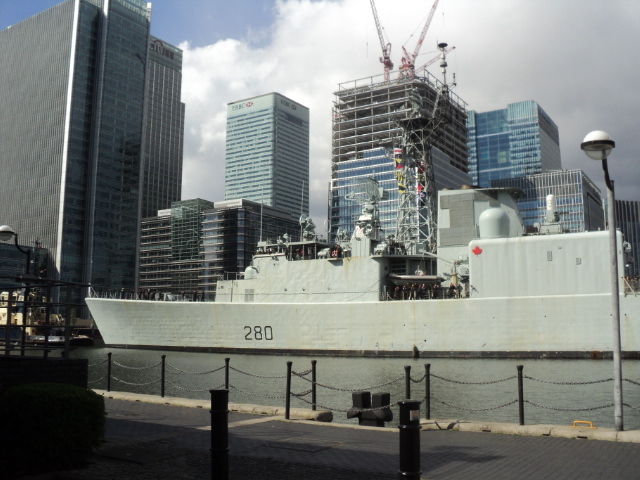 Regular readers of the blog will know that I often comment the Isle of Dogs is relatively unknown to fellow Londoners and a wider audience . 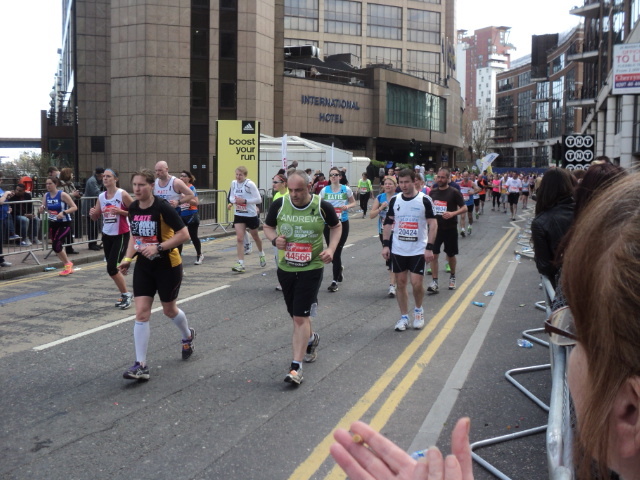 However for one day in April it receives national and international interest due to its role in the London Marathon. Many thousands of people will be pounding the streets of the Isle of Dogs and many thousands more will be lining the streets. 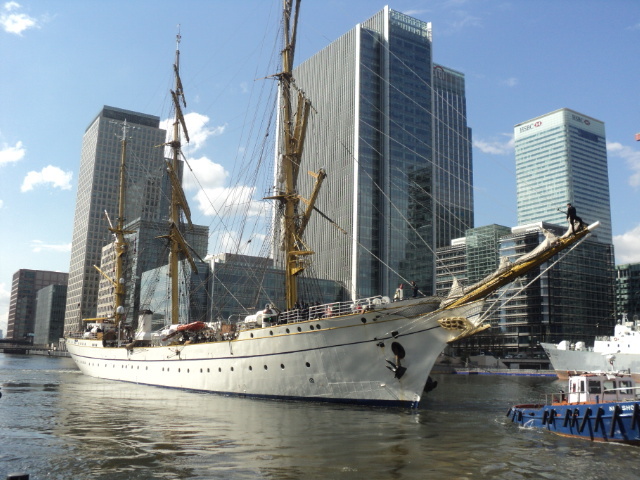 However this is a bit of a contrast to the early days of the Marathon in the 1980s when the Isle of Dogs suffered from transport problems and spectators generally watched the race in Greenwich and Central London. 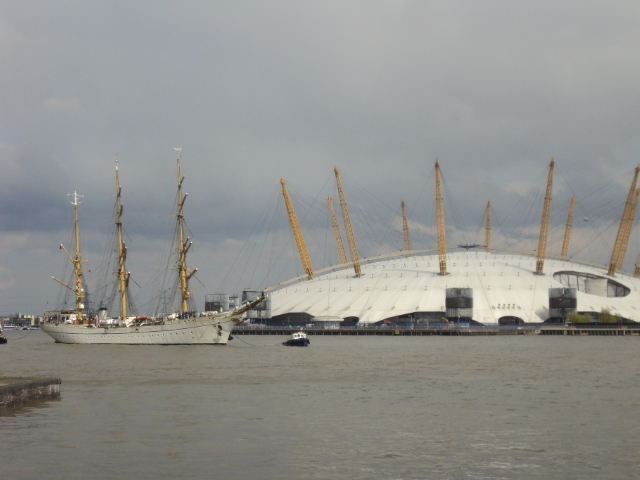 Local people supported the race but the population of the Isle of Dogs was a great deal smaller than today. 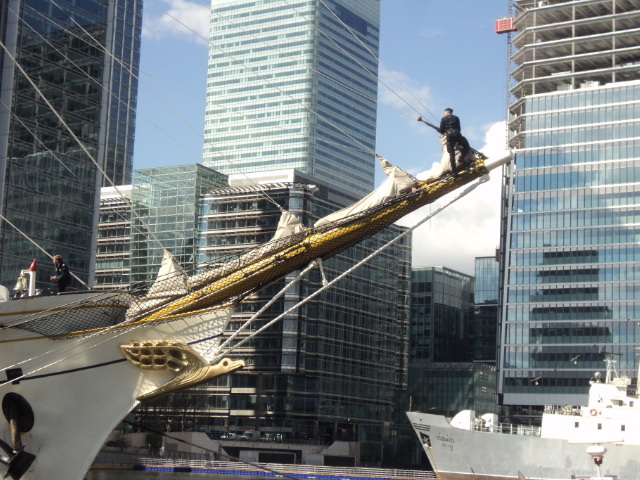 In the 1980s and 1990s race organisers had to contend with the massive building projects in Canary Wharf and often had to make small adjustments to the course. A bigger change was made in 2005 , when the organisers decided to go anti – clockwise around the ” Island”. 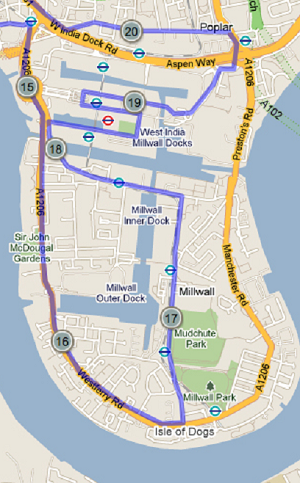 For most runners the narrow streets and the winding part of the course in the Isle of Dogs at the 14 – 21 miles point has always been a challenge. 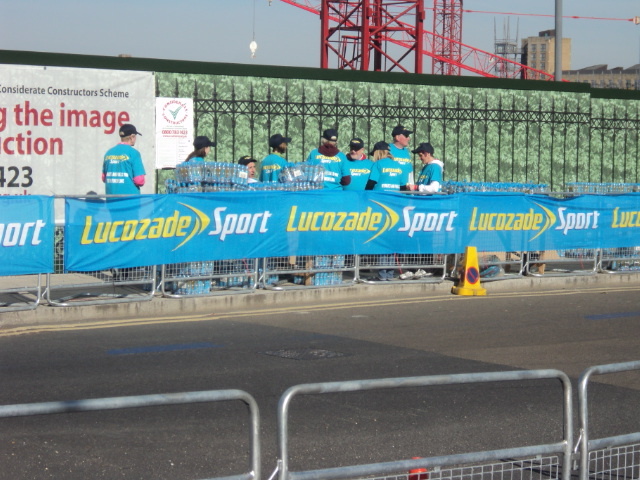 For a number of runners they hit the “wall ” at this stage and struggle to complete the course. The Marathon itself has grown in size and popularity year by year balancing the elite races which has been won by some of the greatest marathon runners and the mass of runners who include some who often dress up in outlandish outfits.This year there will be added interest with the appearance of Mo Farah long distance hero from last years Olympic in nearby Stratford. 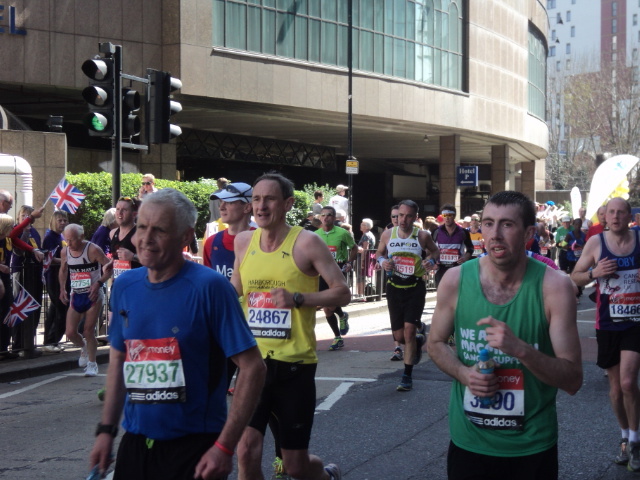 The first London Marathon was held in 1981, more than 20.000 applied to run, 6747 were accepted and 6,225 crossed the finishing line. 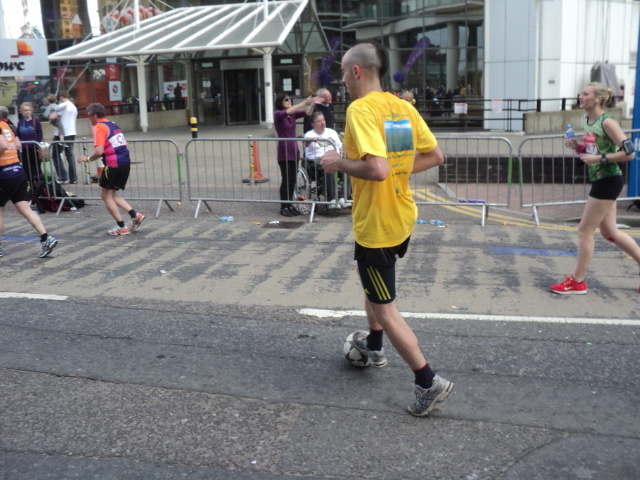 In 2012 a record 36,705 crossed the line out of the 37,227 who started. 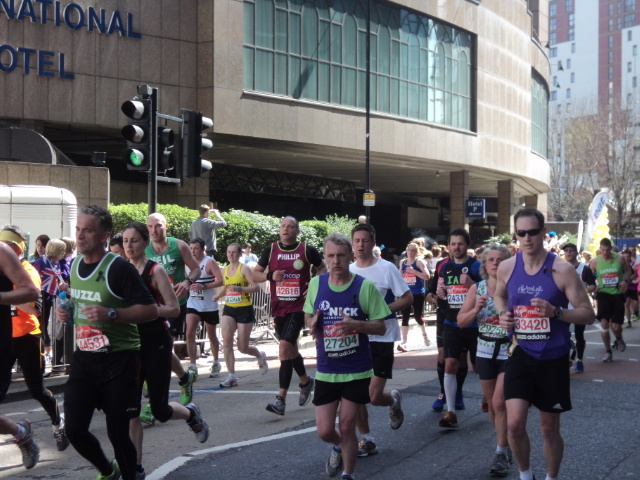 The London Marathon is the largest annual fundraising event in the world, in 2012 runners raised £52.8 million for charities taking the total raised in all the London marathons to a staggering £610 million.